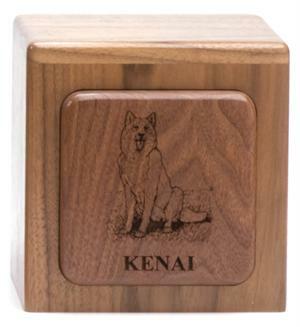 Oak with a light honey stain or walnut (as pictured) with a dark mocha stain, both with a satin finish. 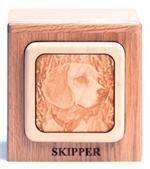 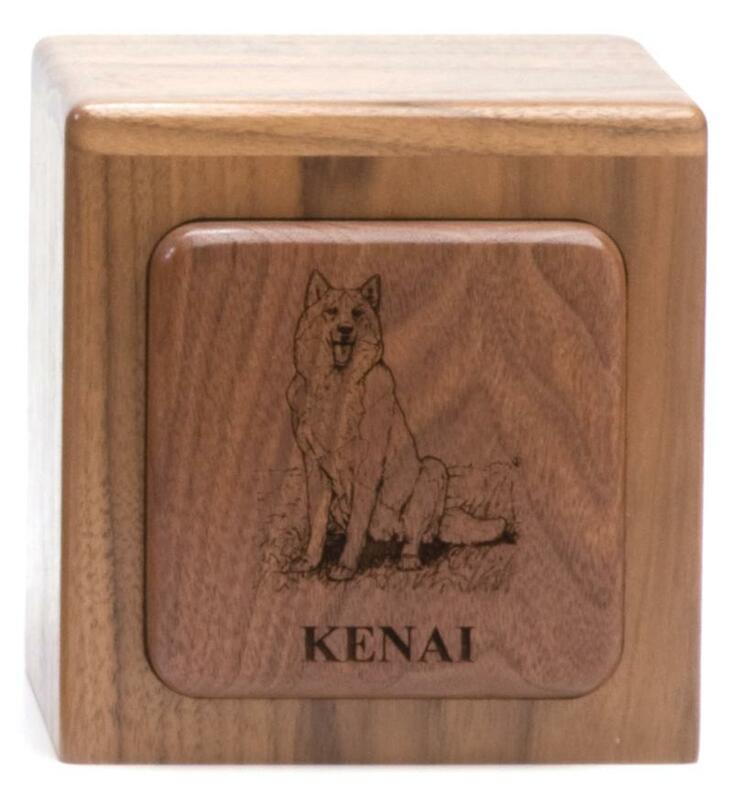 Personalization is included as a laser-etched wood panel featuring dog of your choice from breeds listed below. 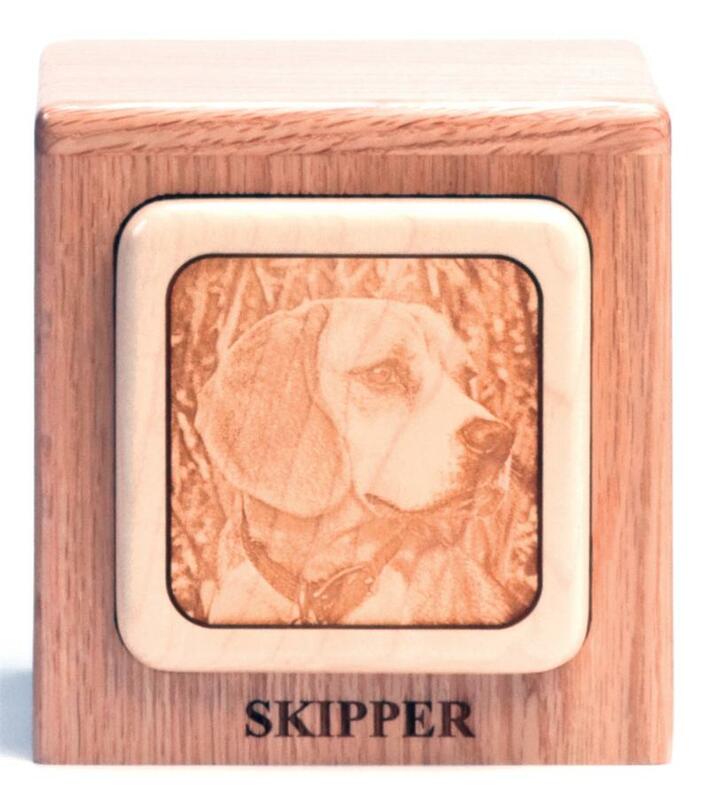 You may choose from Times New Roman Bold and Times New Roman Bold Italic in either all UPPER or Upper & Lower case for engraving of your pet's first name. 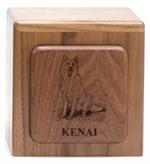 Breeds Available: Afghan Airedale Terrier Akita Australian Shepherd Basset Hound Beagle Bedlington Terrier Bloodhound Borzoi Boston Terrier Boxer Bulldog Bull Terrier Cav King Charles Spaniel Chesapeake Bay Retriever Chihuahua Chow Chow Cocker Spaniel Collie Dachshund Dalmation Doberman Pinscher English Setter English Springer Spaniel German Shepherd German Shorthaired Pointer Golden Retriever Great Dane Greyhound Irish Setter Keeshond Labrador Retriever Lhasa Apso Mastiff Miniature Schanuzer Old English Sheepdog Otterhound Papillon Pekingese Pomeranian Poodle Rottweiler Saint Bernard Saluki Samoyed Scottish Terrier Siberian Husky Staffordshire Bull Terrier Toy Poodle West Highland White Terrier Wire Fox Terrier Yorkshire Terrier Please call to order with your breed preference and pet's name for etching. 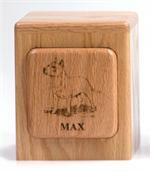 Would you like to have your own pets photo laser etched onto the urn?